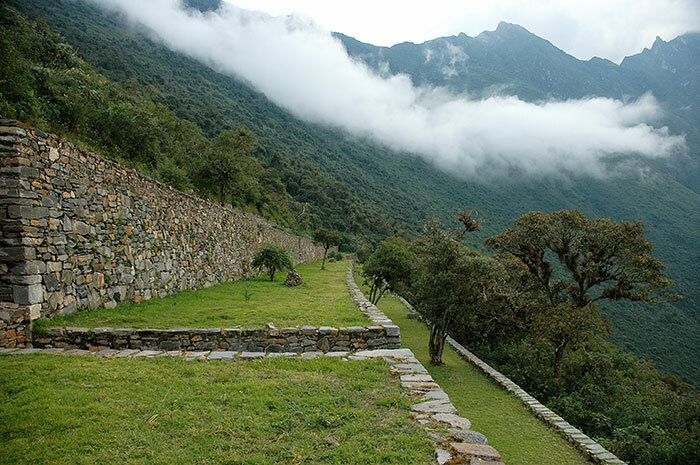 Choquequirao is a recently rediscovered ridge-top Inca site far away in the Andes about two days walk from the remote city of Cachora. 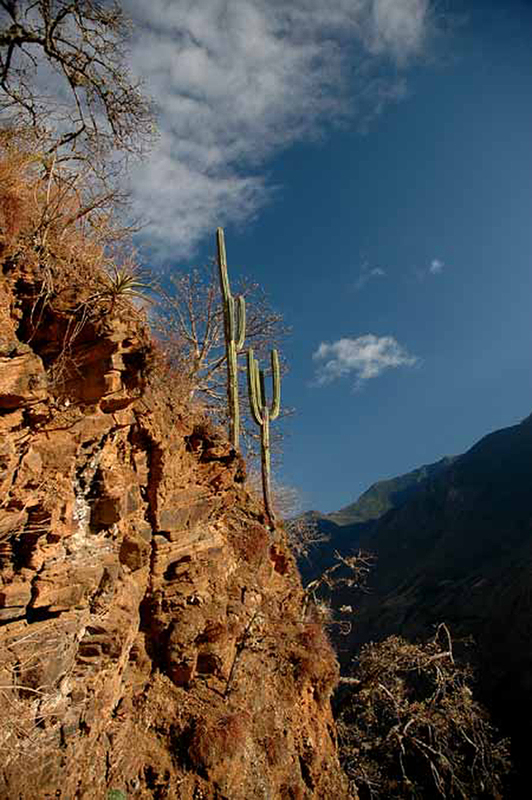 Cachora again, is circa 4 hours drive north of the Inca capital of Cuzcu. 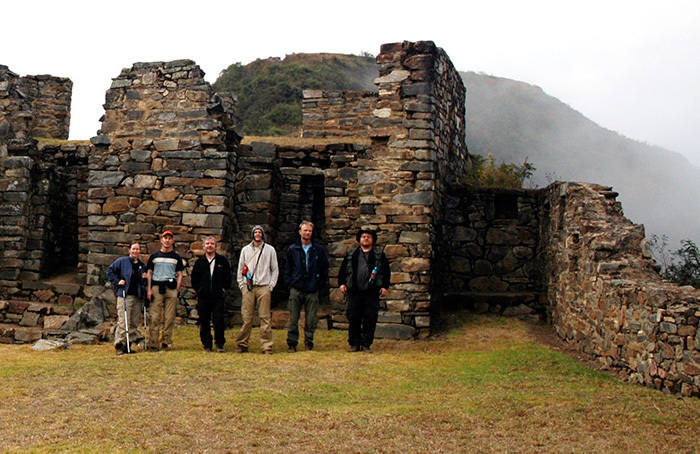 Because we waited too long to order a trip on the Inca Trail to Machu Picchu, we decided to walk the Inca trail to Choquequirao instead. 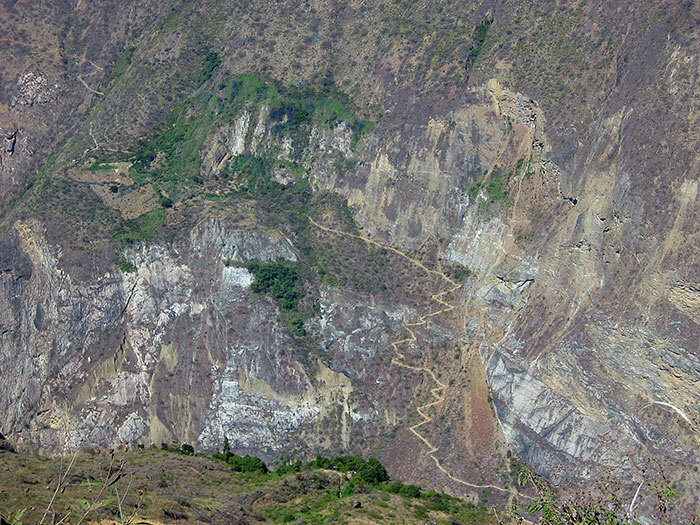 Back and forth, it was about 60 km from Cachora to Choquequirao. 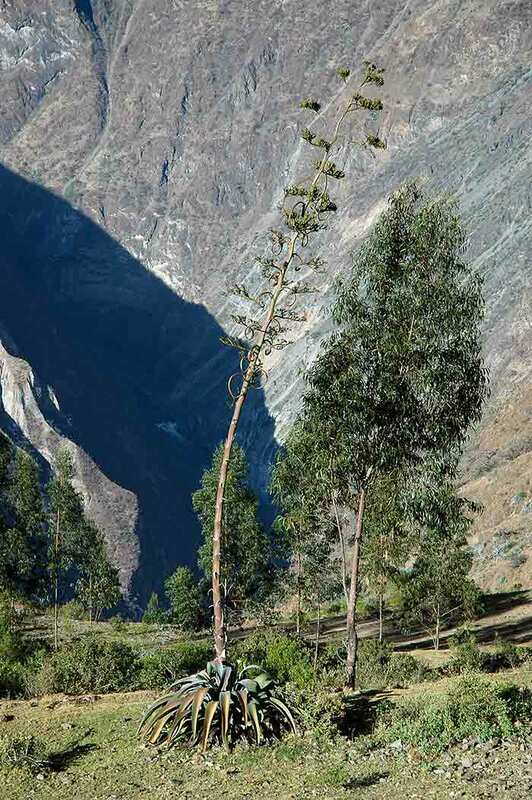 It was a nice trek, to be sure, but at the same time a very strenuous walk. At least for me, an office backbencher out of shape, and with stamina like a sack of potatoes. 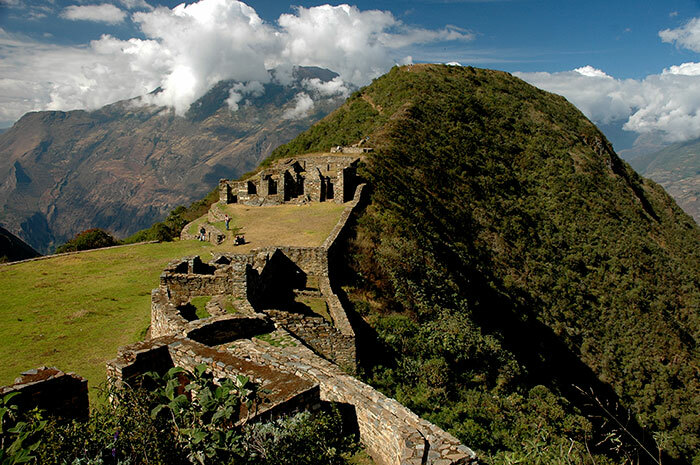 The Incas were crazy, building cities on the mountain tops, and far away from everything. Not so strange their culture vanished shortly after the Spaniards arrived in their backyard. 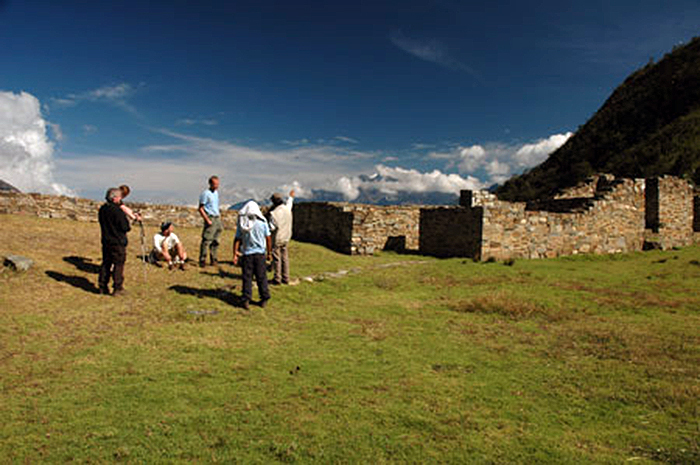 Below a short description of this Inca site can be seen. 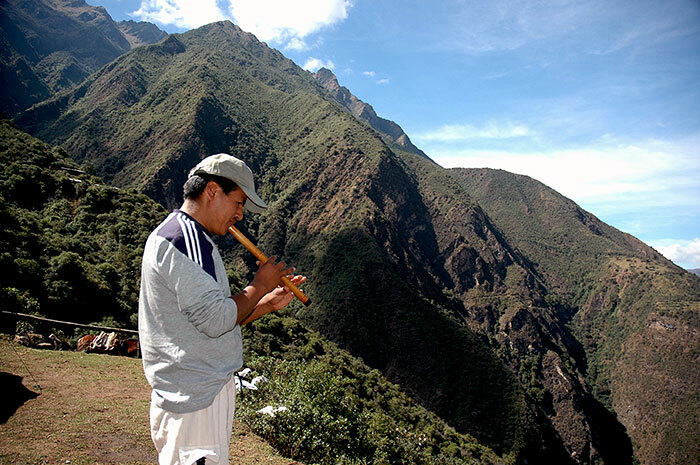 Choquequirao sits in the saddle of a high Andean ridge,3000m./10,000 ft. above sea level and 1,500m./5,000 ft. above the roaring waters of the Apurimac River. 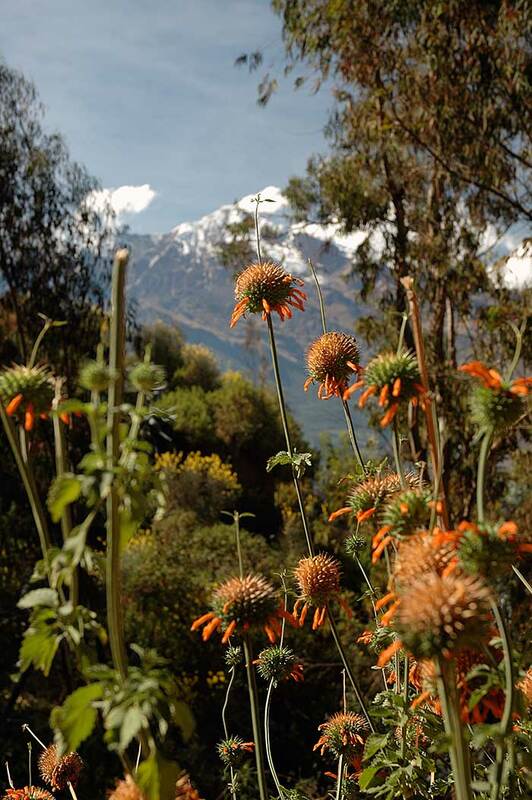 Ringed by spectacular snow-capped peaks and flanked by plunging, thickly forested slopes, the city is an inspiring example of an elite Inca ceremonial center, dedicated to the worship of the mountain gods, the river and the elements of nature. 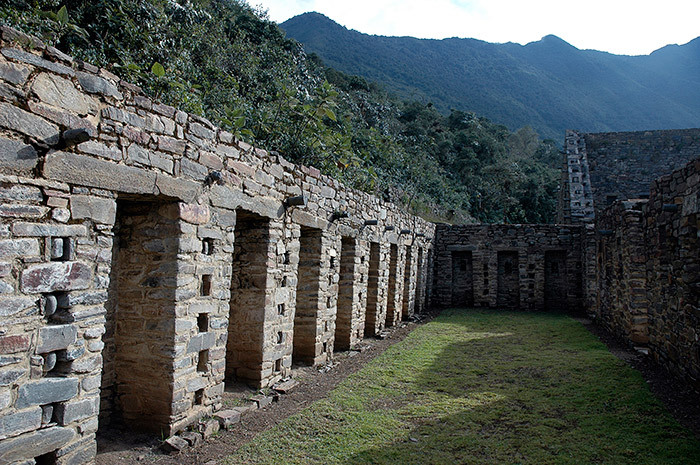 Choquequirao has been called “Machu Picchu’s sacred sister”, because of the striking similarities of design and ceremonial architecture to its famous counterpart above the Urubamba Gorge. Yet it remains an enigmatic place whose history is a matter of speculation. 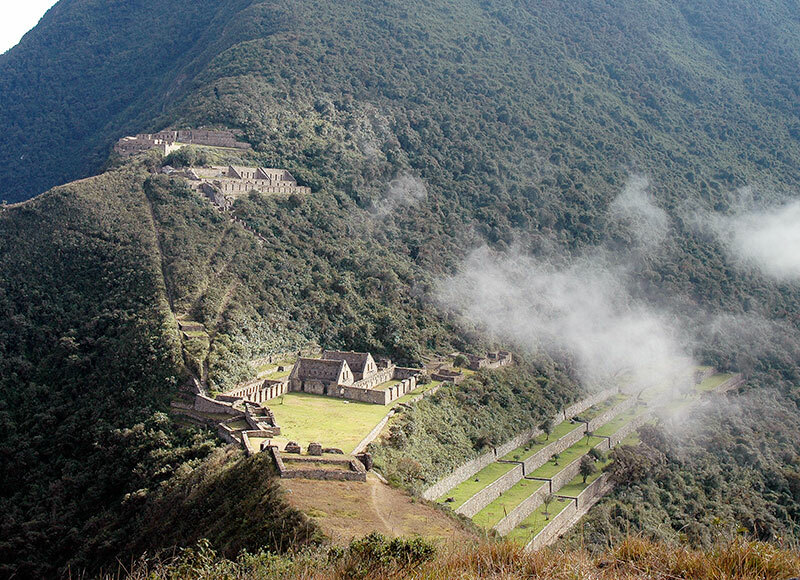 One theory of its origins holds that it was a royal estate built for the emperor Topa Inca, perhaps in an attempt to rival his father Pachacuti’s spectacular domain at Machu Picchu. 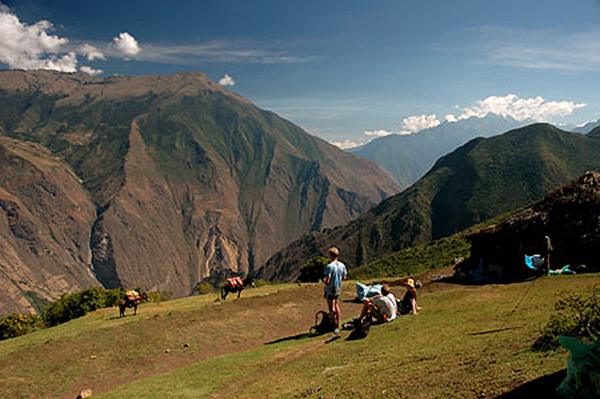 Today we can trek to Choquequirao via a modern footbridge across the Apurimac River. 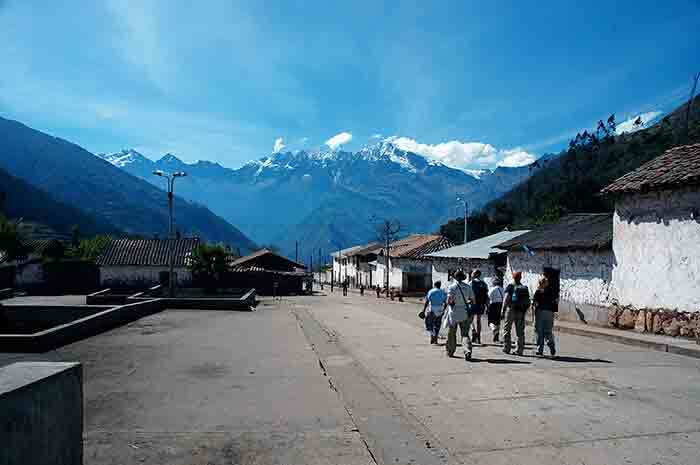 The journey is as awe-inspiring as ever, taking us through an astounding range of ecological zones, from Andean farming valleys, descending through a hot and arid canyon environment featuring kapok trees, cactus and agaves, and climbing again to a region of lush cloud forest, beneath the dizzying snowcaps of the Cordillera Vilcabamba. Up extremely early in Cusco, around 5 o'clock in the morning. 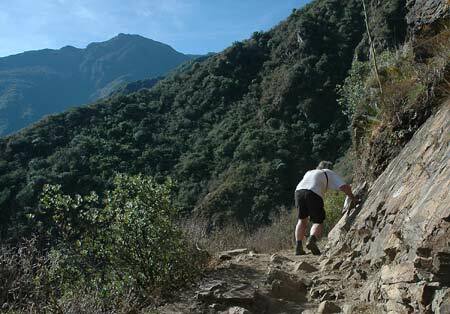 Mainly to ensure that we would reach Cachora and start the walking before lunch. 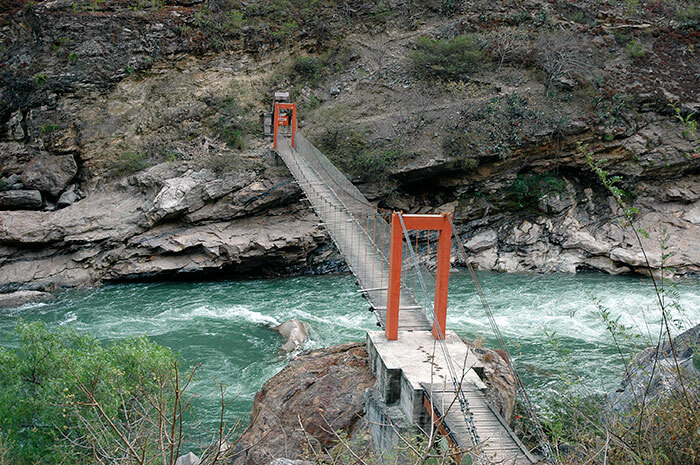 Only to experience that the road was closed on our way there (they were building bridges). We had to wait for two hours, and were served breakfast on the roadside. Well, around noon we arrived in Cachora, and after lunch, we started walking towards the spectacular snowcapped mountains. 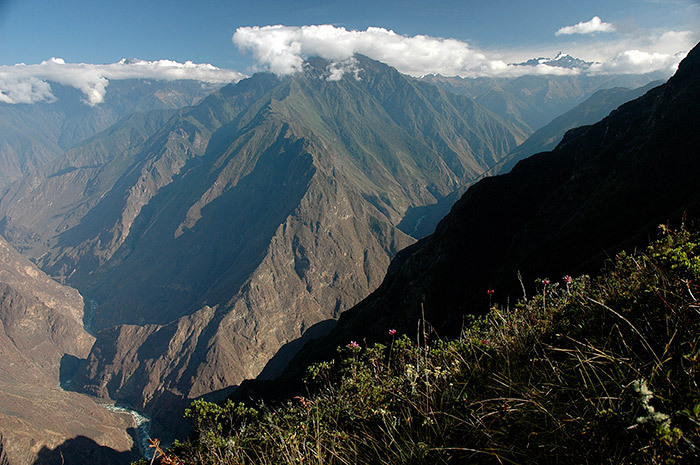 Very scenic landscape. 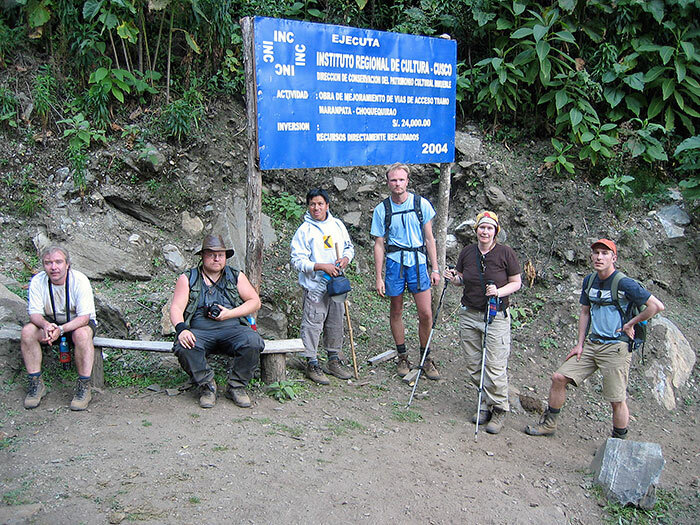 This day we walked 17 km, and the "sherpa's" put up camp at Chiquisca. It became dark before we reached the campsite. 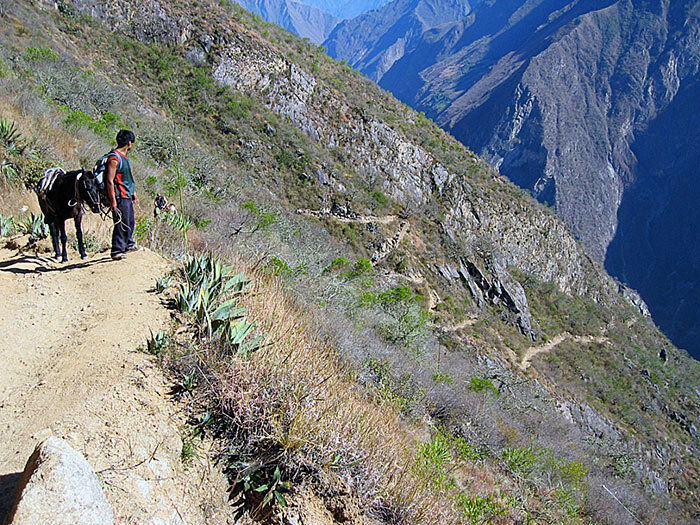 Even though the walk lasted only about five hours, the 1000 meter descent was quite hard, and we (or was it me?) were happy finally reaching the tents. This first day we learnt one thing. 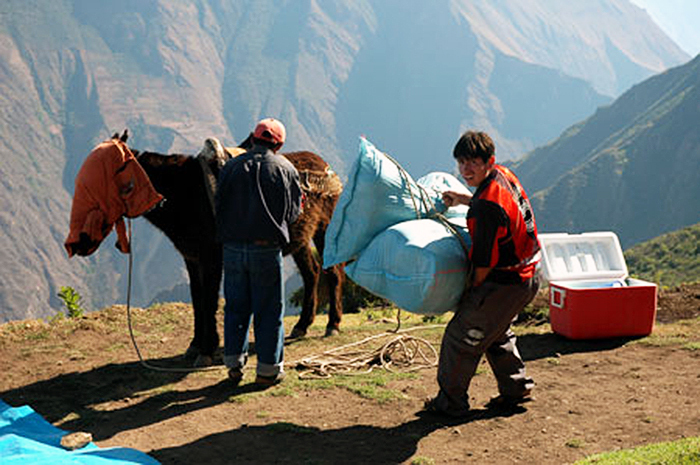 The trip we bought from The Inka Wasi Travel company was more luxurious than we thought in the first place. 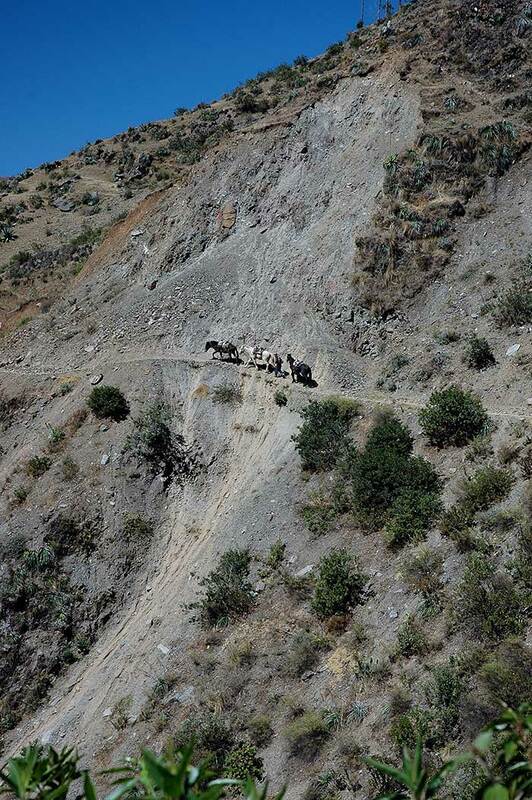 Seven mules carried the equipment, including our backpacks, and two small horses were available for riding (a very good idea, it turned out). 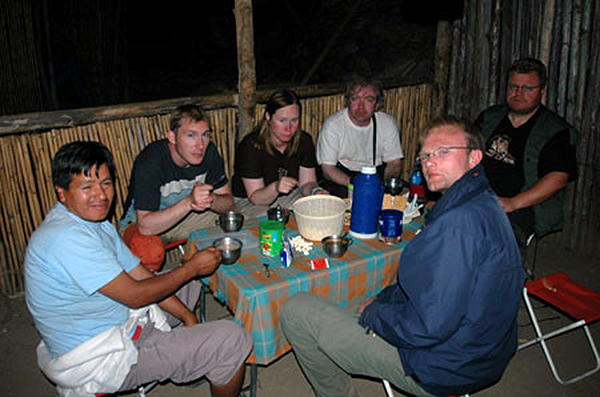 And we were followed by Marco, our guide, an excellent cook, plus a bunch of helpers (six the first day, later five). 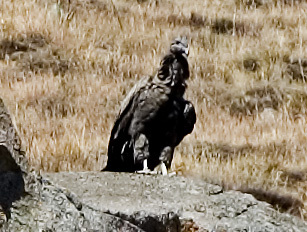 These locals were amazing, they ran up and down the mountain-sides like maniacs. 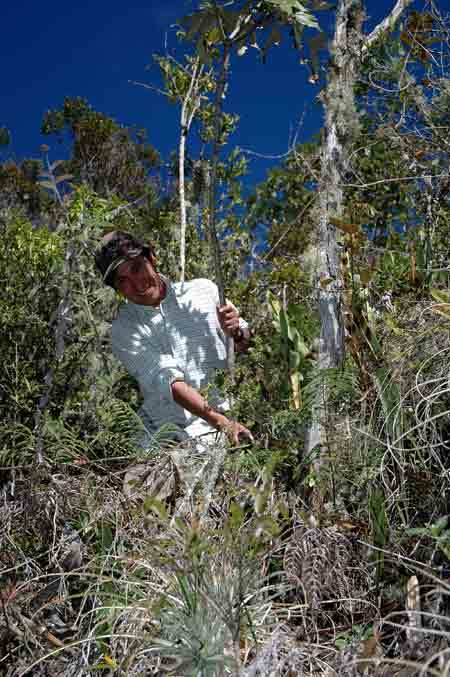 And they put up camp very fast, and were helpful if we needed something. Up around six o'clock. 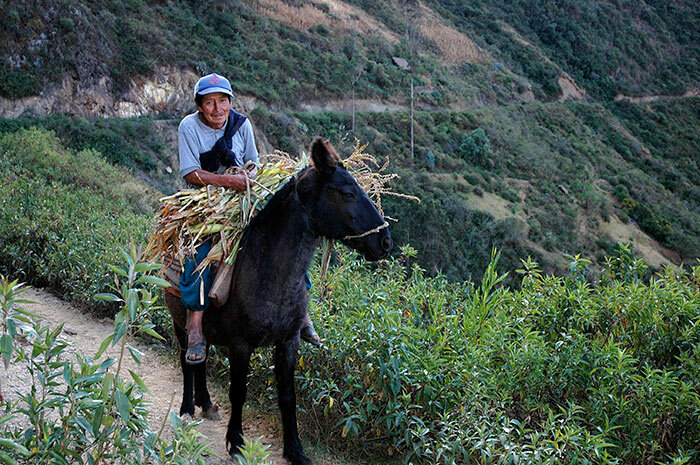 Kick starting with a cup of green tea made of coca leaves, brought to us by the sherpa's every morning. 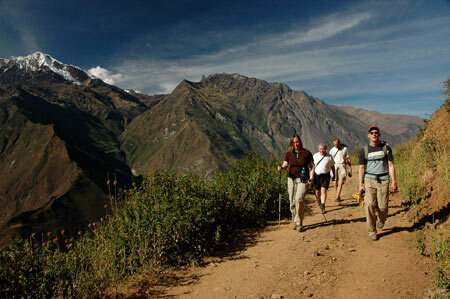 We walked down to the Apurimac river, situated at 1550 meters above sea level. After crossing the bridge across the river, it was uphill. 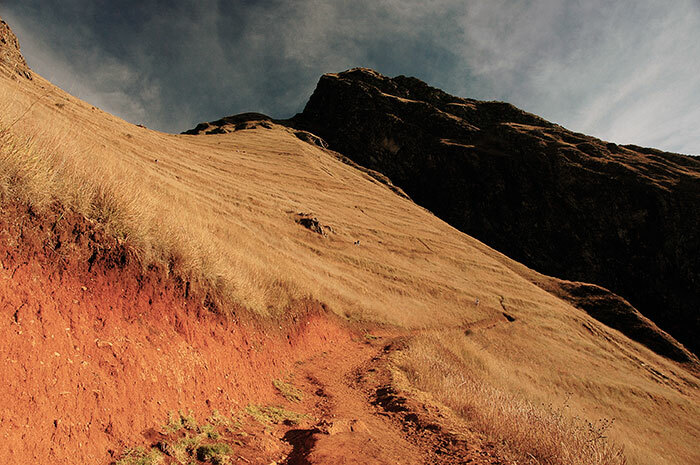 Almost 1500 meter zigzagging up, in a steep climb up the mountain to Maranpata, situated around 2900 m.o.s.l. In between we had a quick stop at Santa Rosa, in the middle of the hillside. Crazy kid stuff! We had an excellent cook. This was the standard! 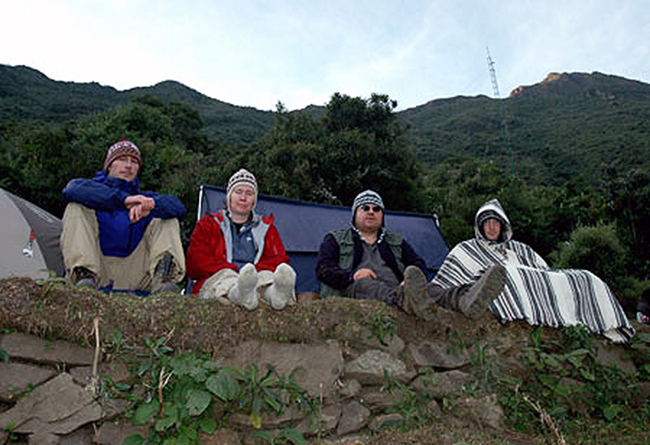 Very early and before breakfast (5:00 am) we traveled towards Choquequirao, where we remained for about three hours, and where Marco told us the details about this important Inca refuge. 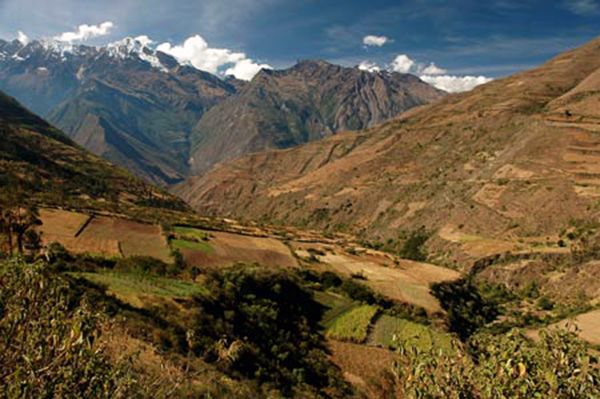 We then returned to Sunchupata, descended to Santa Rosa, where we stopped for lunch. Thereafter we continued descending to Playa Rosalina that took about one hour. 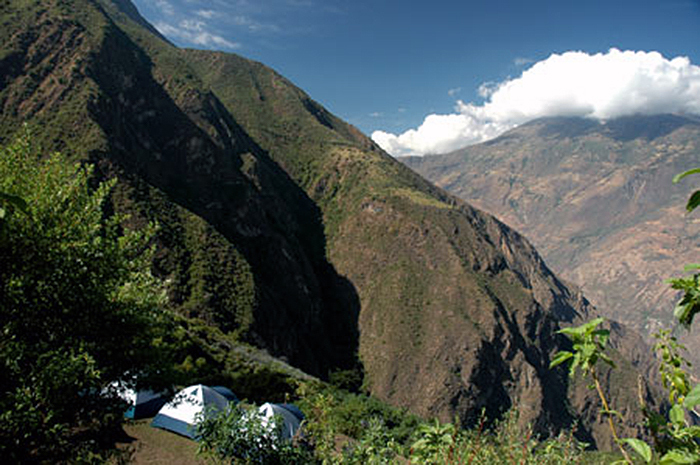 Upon our arrival at Rosalina we continued the journey to the campsite of Chaquisqa, two hours away from Rosalina, where we spent the final night. 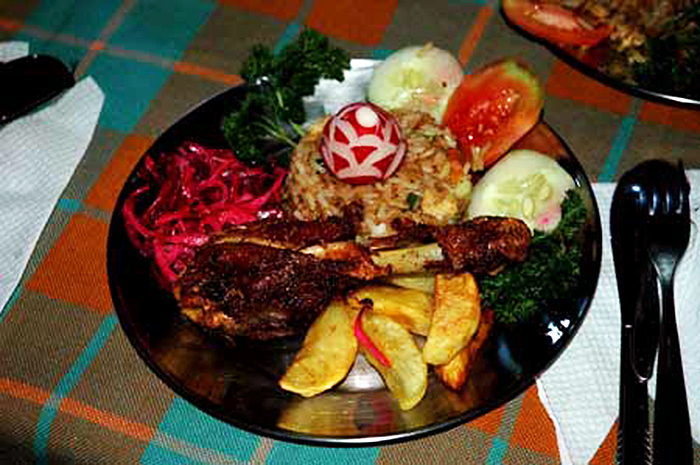 Breakfast was served in Chaquisqa (06:00 am) after which we returned along the same route to Cachora along the canyon of Apurimac, over the pass of Capuliyoc. 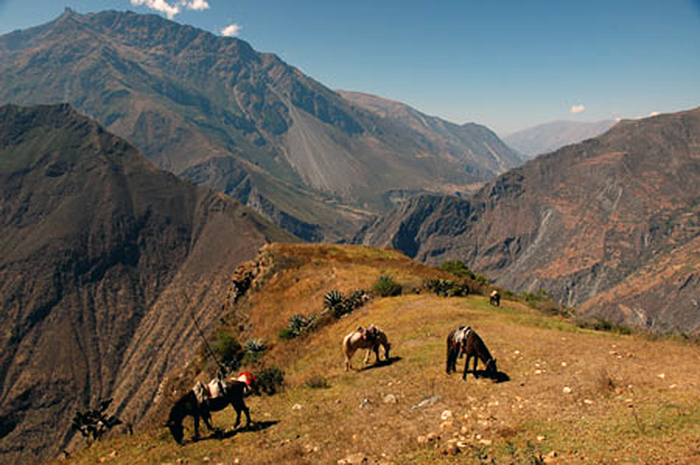 From here, it took another two hours to reach the village of Cachora. Finally, we made it back to civilization, or at least to the pickup car. All in all, it was a great but strenuous trip. 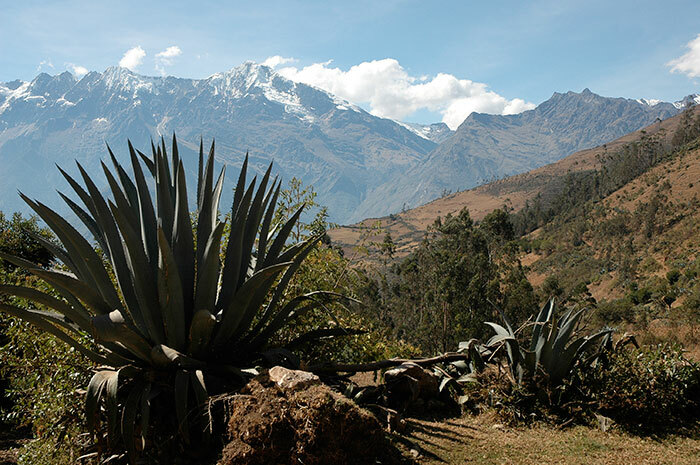 And after a couple of days one tend to forget all about the tiresome hiking, and just remember the fantastic nature in this remote part of Peru.